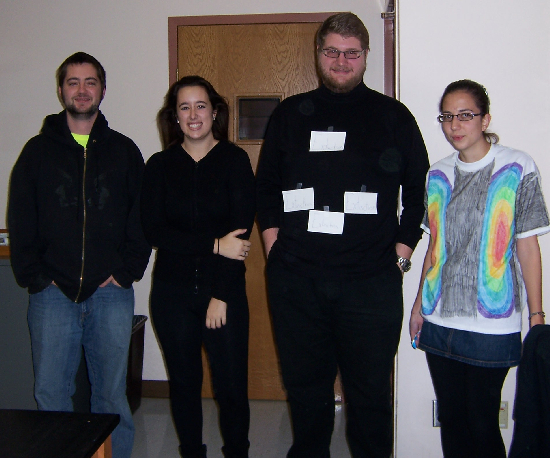 Tomorrow is Halloween, but Mineralogy students celebrated the holiday today by dressing as their favorite optical property. Guess what the people in the picture below are dressed as (hint: they are all under crossed polars!). 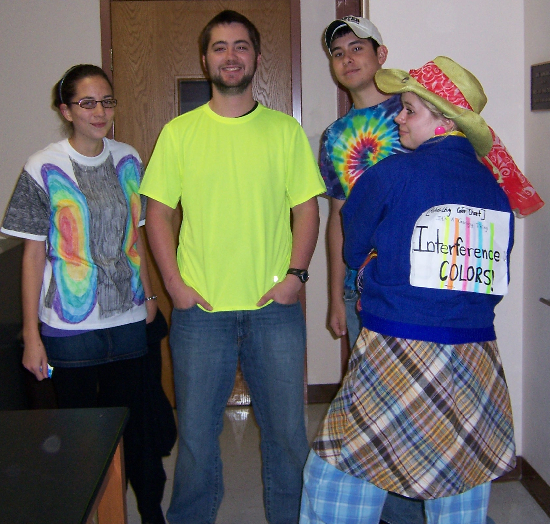 Becky Alcorn, Colin Mennett, Nick Fedorchuk, and Megan Innis are dressed as interference colors! Can you determine their birefringence? Colin Mennett, Elizabeth Deering, Micah Risacher, and Becky Alcorn are at extinction! 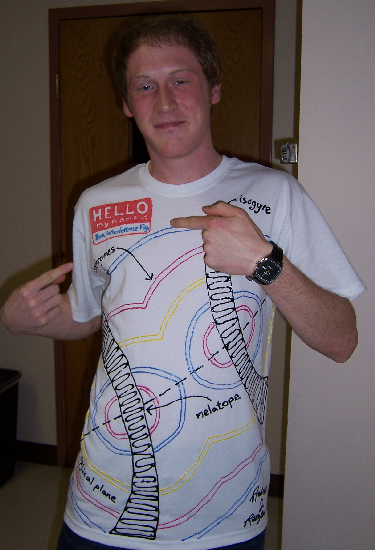 Retzler dressed as a Bxa interference figure. Lindsey is a "crossed polar." Get it? Grumpy = crossed Polar! Wooster Mineralogy students bring a whole new meaning to optics! 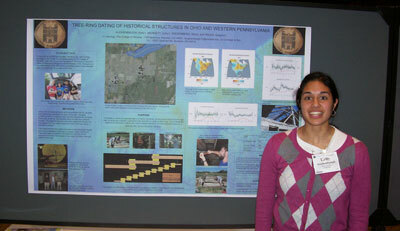 Kelly Aughenbaugh presented the results of her study in a session on Archaeological Geology with a presentation entitled "Tree-Ring Dating of Historical Structures in Ohio and Western Pennsylvania"
Stephanie Jarvis presented her summer research in an interdisciplinary session entitled: What Does Biology Have to Do With It? 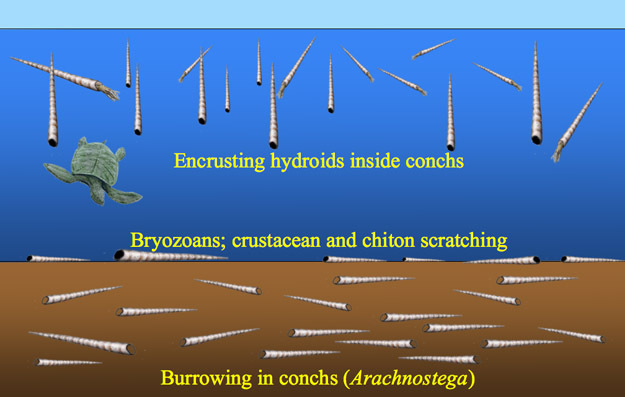 Biota in Weathering, Nutrient Cycling, Mineral Surface Interactions, and Mineral Precipitation. 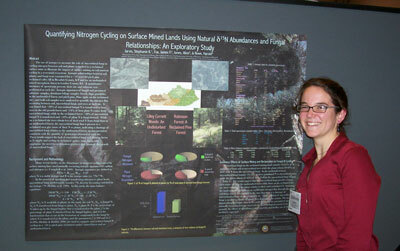 Her poster title was "Quantifying Nitrogen Cycling on Surface Mined Lands Using D15N Abundances and Fungal Relationships:An Exploratory Study". 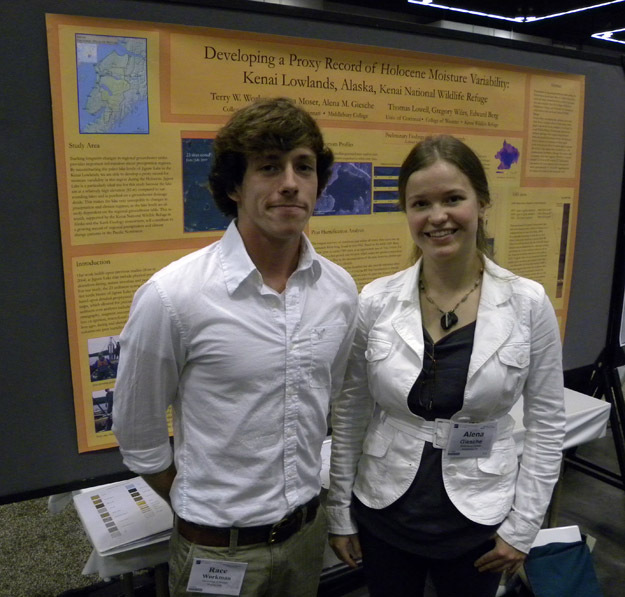 Terry Workman (Wooster) and Alena Giesche (Middlebury College) presented results of their work in Alaska that analyzed multiple lake cores to investigate past water levels on the Alaska's Kenai Peninsula. 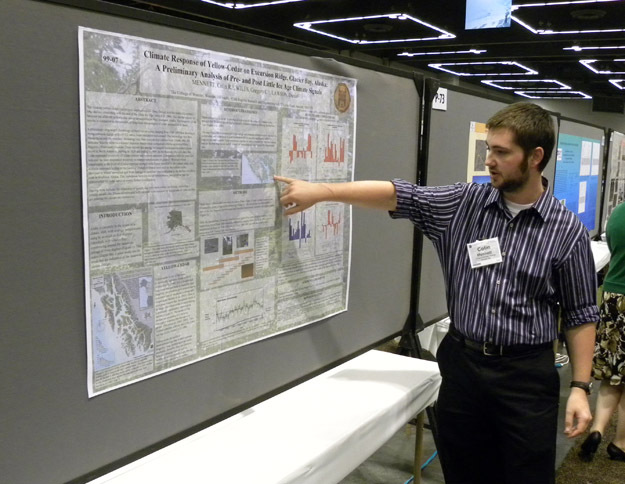 Their poster is entitled Developing a Proxy Record for Moisture Variability through the Holocene for the Kenai Lowlands, Alaska, Kenai National Wildlife Refuge. 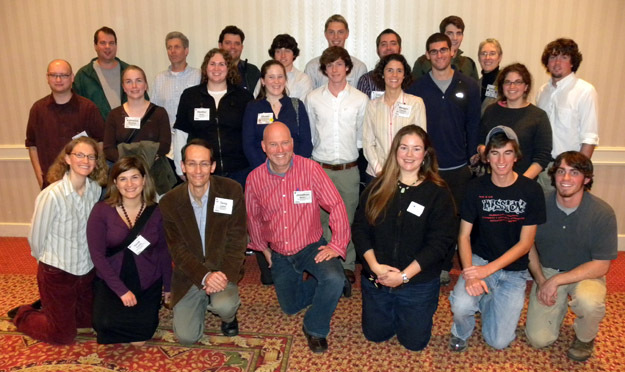 Wooster Geology alumni, faculty, students and friends at the Geological Society of America annual meeting. A wonderful set of geologists! This is an impressive group for a small college, and it is only about half of the Wooster people at the meeting. 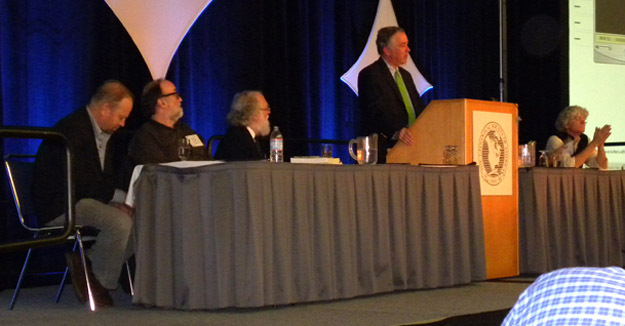 From the left, Randy Olson (scientist-filmmaker best known for the movie "Flock of Dodos" and the great book "Don't Be Such a Scientist"), Ray Troll (extraordinary artist with evolutionary themes), Roger Thomas (Paleontological Society Secretary and moderator), Judge John E. Jones (at the podium), Jeremy Jackson (hidden, alas, by that podium), and Kevin Padian (paleontologist, star witness in the Dover Trial, and professor at the University of California, Berkeley). The lessons that emerged for me from the riveting conversations: (1) The communication of science to the public is an essential part of the role of a scientist; (2) Most scientists are not very good at it; (3) All scientists can learn to be better communicators; and (4) It is not too late but we have a lot of work to do. Jeremy Jackson made the strong point that evolution is part of life around us and can be made immediately relevant to any audience, but that it takes time and effort. Randy Olson emphasized that scientists need to make much better use of media sources. Ray Troll showed how humor and cool art can have an enormous influence on public perceptions of science. Kevin Padian encouraged us to address the “middle 50%” of the public which is open to learning and making their own decisions, and that we need to control the agenda of the debate and the use of our own scientific terms. Judge John E. Jones, besides being a heroic and wise judge in the Dover Trial, showed us that rational argument well presented really does make a difference. All agreed that the issues go beyond evolution in this country to include other sciences, history, literature, art and civics. 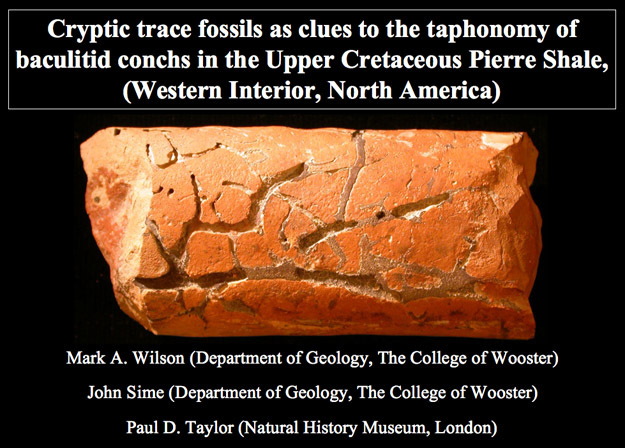 It was a pleasure to see that three of the questions from the audience were asked by Wooster paleontologists: Tricia Kelley, Lisa Park and John Sime. Very good questions, too, which received thoughtful answers. Much to do, and soon. 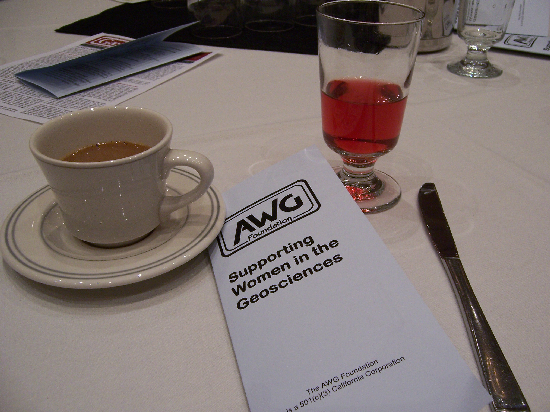 I was fortunate enough to have a ticket to the sold-out Association for Women Geoscientists (AWG) breakfast. How inspiring it is to be surrounded by women and men who support and promote female geoscientists! After a heartfelt series of stories from students and colleagues, Dr. Anita Grunder (Oregon State University) was awarded the AWG Outstanding Educator Award. Dr. Grunder’s impact on women geoscientists is significant and tangible, which challenged me to think about the ways that I can contribute to this cause. Coffee and juice at the AWG breakfast. I would have taken a picture of the food, too, but I ate it all and my plate was cleared before I remembered to pull out my camera. Trust me, it was delicious! AWG promotes women in all fields of geology at all stages of their careers. They offer numerous scholarships, awards, and resources for students. They also hold gatherings to help their members develop strong support networks. At my table, I spoke with women who began their careers as chemists and realized, after working in the field for several years, that their passion was geology. We were joined by other female faculty and AWG leadership. I was glad to see that a couple of Wooster grads took advantage of the opportunity. 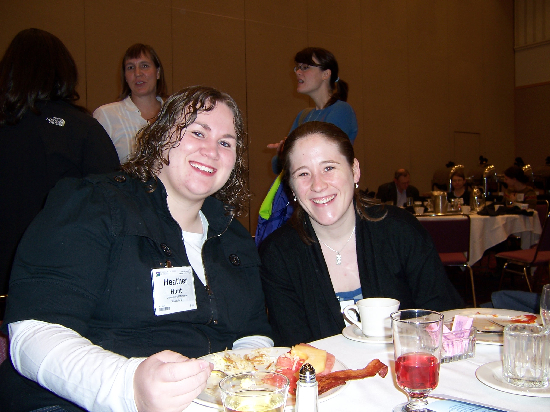 Heather Hunt '09 (left) and Elyssa Krivicich '09 (right) at the AWG Breakfast. Although it was unintended, this picture exemplifies the strength of the networking opportunities provided by AWG. Above Heather’s right shoulder is Kim Hannula, author of one of my favorite geoblogs and a geology professor at a liberal arts college in the Rockies. Sitting at the table behind Elyssa’s left shoulder is LeeAnn Srogi (center), a new collaborator of mine from West Chester University, who I am co-leading a field trip with at the 2010 Northeastern/Southeastern GSA meeting. This post is for my Instructional Technology Fellows. #GeoPort is the GSA Portland twitter hash tag, so you can follow what people are saying about the meeting. GSA also posts meeting updates on its own twitter feed and facebook page. If you prefer to read blogs, check out the GSA Portland blog roll, which includes our own Wooster Geologists blog. After an important afternoon stop (see Figure 1), I attended an inspiring session on digital innovations in the geosciences. Talks focused on the digital revolution, OneGeology, GigaPan, and Google Earth. The advantages of writing my field notes with a Smart Pen and geotagging my field photos made me wonder why I haven’t been doing these things all along! Thanks to Kyle House, Ian Jackson, M. Lee Allison, Declan De Paor, Ron Schott, and all of the other presenters who so graciously shared their insights and ideas. Figure 1. 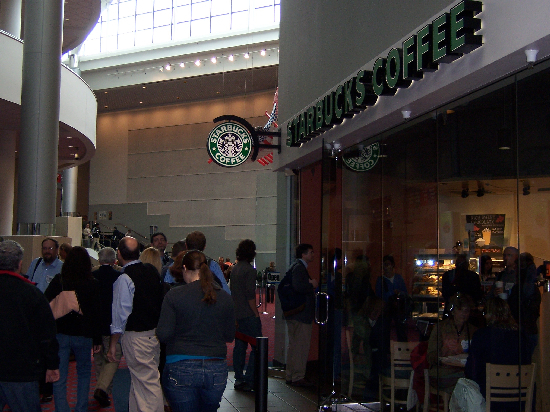 The Starbucks in the conference center is arguably the busiest spot in the entire building. 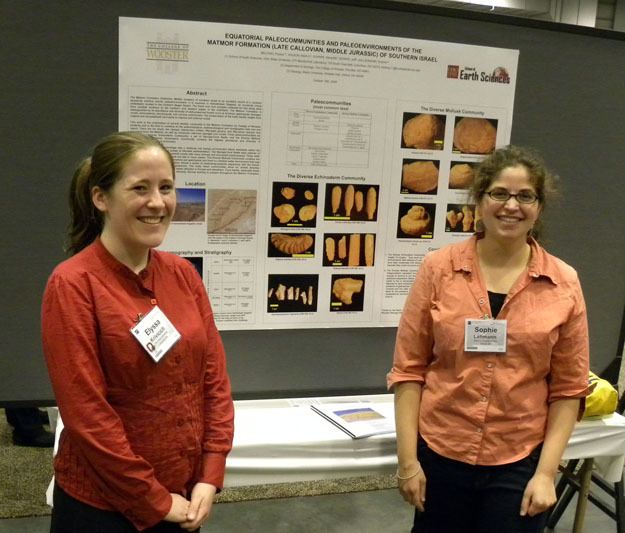 Elyssa Belding Krivicich (’09) and Sophie Lehman (’08) cheerfully presenting their poster on Jurassic marine paleoecology in Israel at the Geological Society of America meeting in Portland. PORTLAND, OREGON–The Paleontological Society has a free short course program it runs on the day before the GSA meeting officially begins. When I began my career the topics were always about some taxonomic group such as “Brachiopods”, “Mollusks”, “Plants” and the like. The purpose was to gather a dozen or so experts on the topic and bring the participating paleontologists up to speed on the latest ideas and discoveries. As you might imagine, as useful as these sessions were, they often became dull recitations of anatomy and classification schemes. Yesterday’s short course was titled “Conservation Paleobiology”. There was some confusion as to what this title meant before it started (is it about preserving specimens in collections? 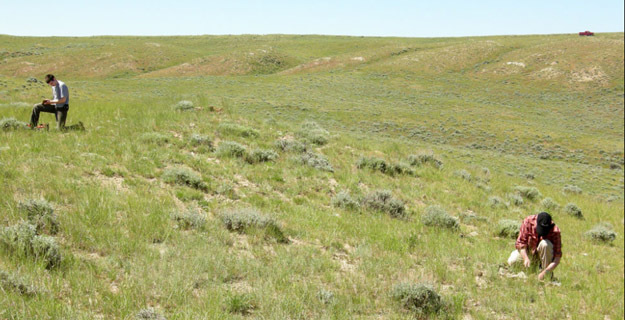 saving paleontological localities from destruction? ), but once it began it was clear this would be a different course from all those which preceded it. Karl Flessa of the University of Arizona (and one of the short course leaders) invented the term for the “application of paleoecological and geochemical techniques to the analysis of the prehistoric and historic skeletal remains of species threatened with extinction.” In other words, the concept is to make paleontology and paleontologists important players in the attempts to limit environmental degradation and preserve ecosystems in this time of climate change, overuse of resources, pollution and overpopulation. Those who study the history of life have much to contribute to understanding current extinctions and other ecological changes. In the more irreverent words of Karl: “Let’s put the dead to work”. The presentation I found most impressive was by Jeremy Jackson of Scripps Institution of Oceanography (and a bryozozoologist of great note, I might add!). In his talk entitled “Historical ecology for the paleontologist”, he emphasized how much our baselines of what we expect to be “normal” for an ecosystem have shifted “beyond recognition from their formerly pristine state”. This shifting began with the first human interactions with the environment. 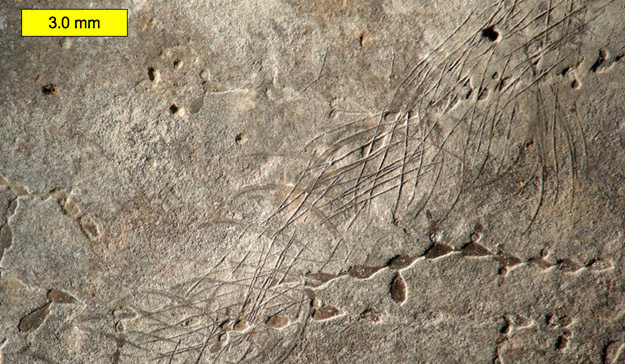 The only way to deduce what “natural” ecosystems really were is through the fossil record. We have altered every environment on Earth to extraordinary degrees, each time shifting our baselines of what we thought it was like in some Edenic past. It was not a happy talk, that’s certain, but it did clearly lay out what contributions paleontologists must make to pull us back from the brink.